Bralettes are cute, comfy, and surprisingly easy to make. 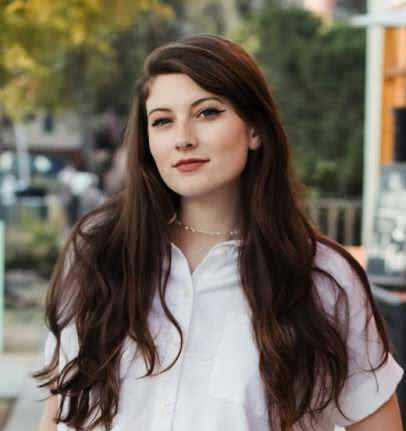 The thought of sewing a bra was daunting at first, but after staring countless bralettes down, I figured out a simple way to sew these suckers up. What you will need for this project! Decorative elastic. I made one bra with just more than a yard. Stretchy fabric. You don't need much, making this project great for those left over scraps! Adjustable straps. You can simply buy these at any store that sells notations, or you could make your own. First things first! We must create the triangle shape for the cups of the bra. If you want you can take another bralette or bikini top and trace it. If you want to draft your own, here is what I did. Measure the bottom of your breast to see what the base of your triangle needs to measure. Then for your two sides, measure the distance from each end point up into a triangle. Also, instead of drawing a straight line for the base of my triangle, I added a slight curved line to account from some body. Since I'm small, I didn't make this curved line deep because there isn't a ton of body to fill out a large curve! Easy right? 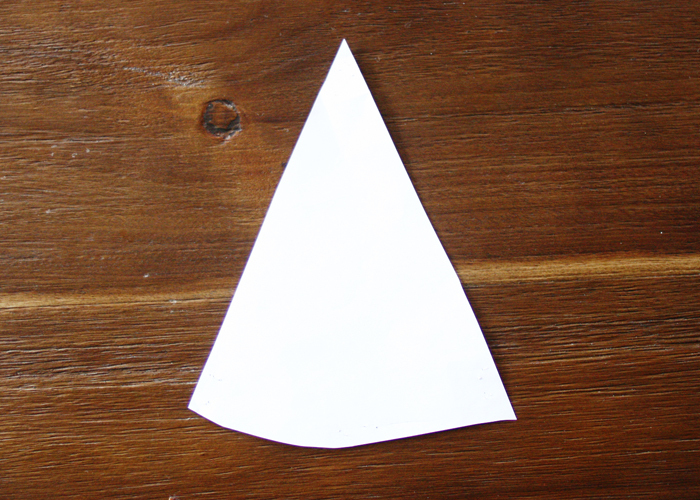 Test out this triangle shape in a test fabric with similar qualities to make sure you have the right size. You will need to cut two triangles out of your fabric. For sewing with elastic and stretchy fabric, you need to use a zigzag stitch. A straight stitch will not allow the fabric and elastics to stretch. The only time you need to use a straight stitch is for attaching the bra clasp and the end of the adjustable straps to the chest band. 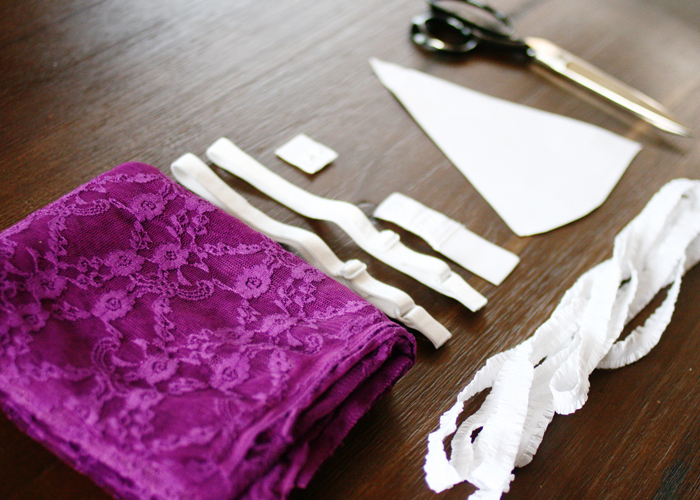 For each side of each triangle, you will need to cut two pieces of your elastic. 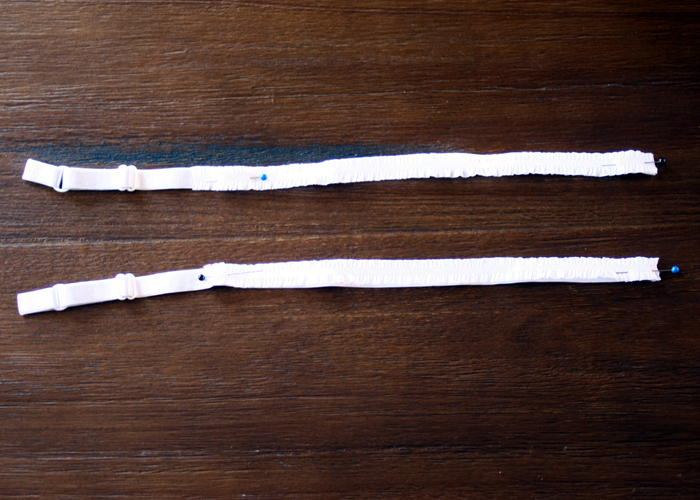 Take your elastic and measure it up against each side. I cut my elastic just a tad shorter than my sides. Sew the elastic to the side and stretch the elastic as you sew. Now we will be making the band. Measure around your body. Take this measurement and subtract 4 inches. 1 inch is subtracted to make it tight around the body, and another 3 inches is subtracted to account for for the length of the bra clasp. These 4 inches can be changed if you think 3 inches for your bra clasp is too much. 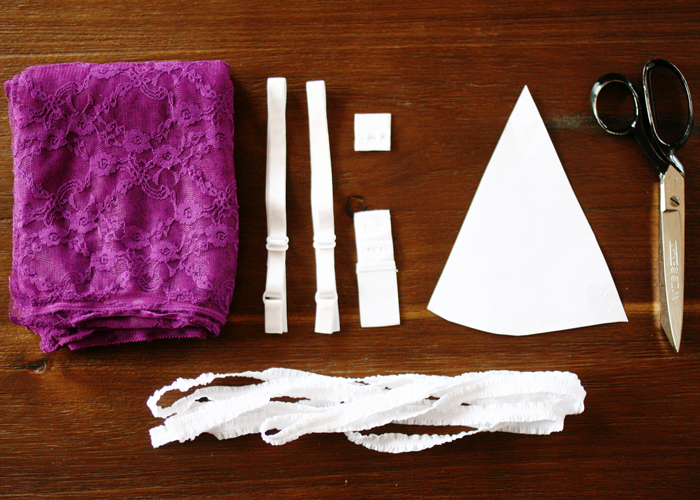 Cut your elastic and sew the bra clasps on to each end. Make sure that your elastic is straight and that you don't sew the clasps backwards! Now to the adjustable straps. I wanted my straps to have some ruffles on them, so I cut some more elastic and sewed it to the straps. 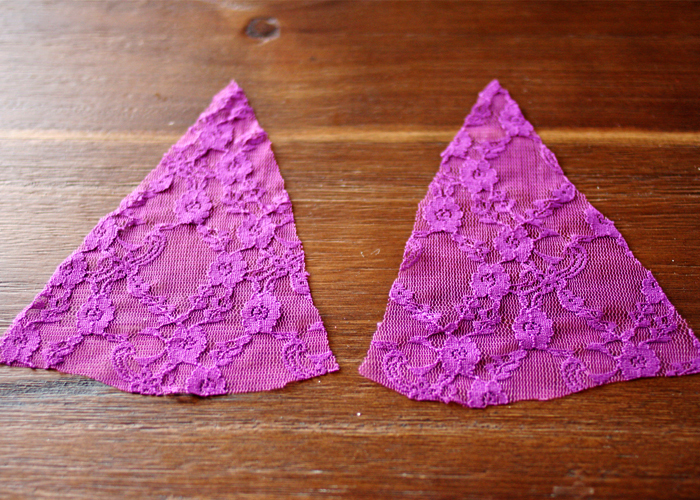 Sew one side of the straps to the top of your triangles. Now pin & sew the bottom of your triangles to the band that goes around your chest. Don't forget we are using zigzag stitches here!! And everywhere!! Mark the middle of the front side of the band, and put the corners of the triangles there to find where to sew. Pinning is great, if you want to make sure you have the triangles in the right place before sewing. Last step here people! 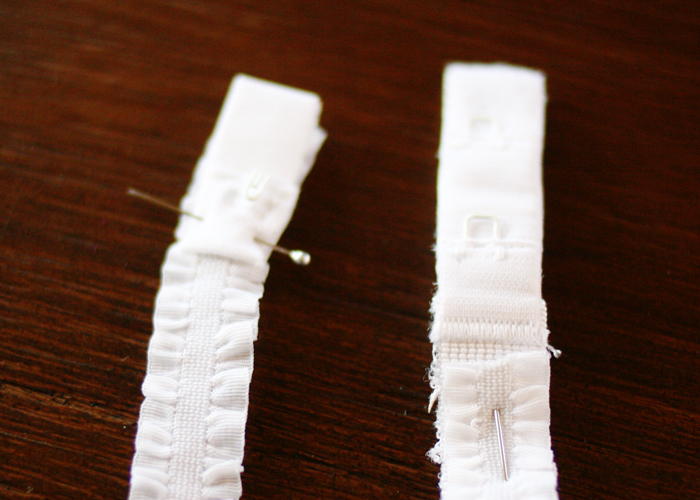 Take the end of the adjustable straps and sew them to the back of the band! You don't want to sew them straight back, move them inward just a bit because if you put them too far apart the straps will fall off your shoulders. Tadaa here you have a bralette! The possibilities are endless here! Add bows, use different elastic, different colors, whatever you want to make a unique bralette.